Buy TheHydianWay a Coffee. ko-fi.com/thehydianway - Ko-fi ❤️ Where creators get paid by fans, with a 'Buy Me a Coffee' button. 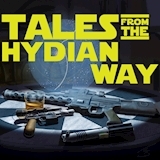 We make the podcasts on The Hydian Way, from RPG discussions about story, Star Wars, and playing to ways of telling a story better. Secured Payments. Support goes to TheHydianWay's account. Upgrade TheHydianWay to a yearly Gold Membership with a one-time payment.